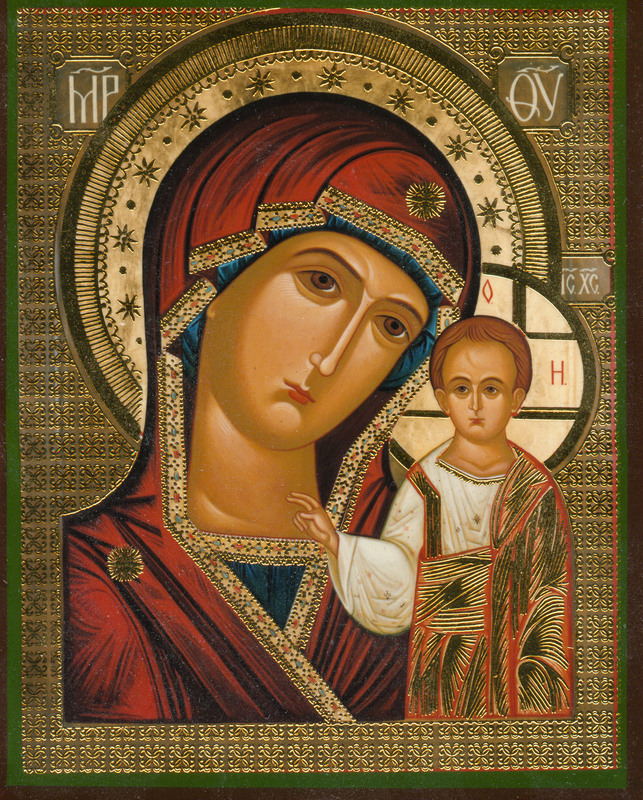 While I was moving some stuff around my office, I rediscovered my copy of Kazan’s Mother of God icon. I haven’t really thought about it since I wrote my first book, but I had recently come across some interesting pieces of misinformation about the icon that cropped up in eighteenth century sources. Before I can relate the later stories, here’s a brief summary of what I know about the icon. According to a manuscript version of the miracle tale from the beginning of the seventeenth century, during a fire in Kazan’ on June 23 June, 1579, the icon appeared in a vision of a young girl, instructing her to take shelter in Church of Nikolai Tulskii the Miracle-worker. The tale informs the reader that the appearance of the icon during the fire was a reward from God for the Orthodox faithful in Kazan’ for their ongoing battle against “non-believers” (inovernye). Following the first appearance, the icon performed a number of miracles – about ten, the number varies slightly in different versions of the tale. Its miracle-working powers were sufficiently well known that a copy of the icon was carried into battle against the Poles in 1612, where it was recorded as having performed new miracles which, in turn, were recorded in the edifying tale, “About the Advance of the Kazan’ Icon of the Mother of God toward Moscow.” With a proven reputation, Kazan’s Mother of God icon acquired a national festival on July 8, 1633. Having established a reputation of one of Russia’s most famous miracle-working icons, it is not surprising that foreign travelers heard about it. What strikes me as interesting is what they heard about it, because it wasn’t the recorded version of events. Johann-Georg Korb was a secretary in an Austrian embassy to the court of Peter the Great in the 1790s. He mentions the national celebration of the icon that happened during his stay. Korb’s version of events suggests that that icon first appeared during the siege of Kazan’ in 1552 – not twenty years later during a fire. It could be a conflation of both the original appearance in Kazan’ and its later military success against the Poles. His story isn’t the version from the miracle tales, but it is somewhat close. It’s easy to believe that this is either the version he heard in court or what he understood of the story as it was told to him. While Korb’s version seems somewhat based in the miracle tales, nothing in Perry’s version is. It could be that Perry made a mistake in assuming a different miracle-working icon was that of Kazan’ (if so, I don’t actually know which one it was). It could be that someone that Perry knew told him an incorrect story, either out of ignorance or from fun. Perry mentions that when he doubted the story, he was called an “atheist” which raises the idea he was being mocked, if not insulted. Or Perry could have just made it up. I don’t raise this issue because I think travel narratives are unreliable, but I do think we need to be critical of their assessment of any information. While Perry might be our best source for thinking about the problems with Peter the Great’s canal project, that does not necessarily make him a reliable informant on Orthodox culture or beliefs. He does, however, tell us at least one version of ideas floating in the court, even if it’s only his. This entry was posted in Imperial Russia, Medieval Russia, Nostalgia and Memory, Russian Orthodoxy. Bookmark the permalink.